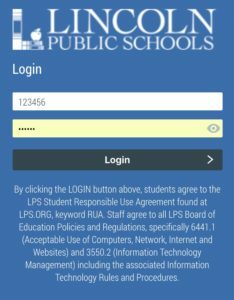 All students (K-12) sign a Student Responsible Technology Use Agreement (RUA) early each school year. The RUA is used differently in elementary than secondary schools. At the beginning of each school year, every middle and high school building has its own processes to re-orient students to District expectations around technology use. This includes the logistical procedures as well as the behavioral expectations around technology use for students. Beyond these back-to-school lessons, each day when a student signs into their Chromebook or the LPS portal (where they find all of their learning materials) they are presented with a reminder of those expectations. These can be viewed in detail at any time by entering LPS.org keyword: RUA . It is a source document for proactive classroom discussions that instruct students about appropriate behaviors when using devices and network services in the classroom setting, as opposed to the behaviors they may express when using devices in a personal (home) setting. Alignment with PBiS protocols as a Tier-1 Universal Support for setting building expectations around the use of devices in all classroom settings across the building. Student ownership of personal behaviors and the consequences that can arise from them. At the end of the discussion, students are asked to sign the “Responsible Use Agreement” which acts as a behavioral contract with their teacher. Students hopefully noticed that the behaviors expected when using technology align closely to the behaviors expected everywhere else in their school.